We had screened a number of patients with chronic obstructive pulmonary disease (COPD) in a referral pulmonary out-patient services (OPD) services in Kolkata, West Bengal, for the presence of pulmonary hypertension (PH). COPD was diagnosed in patients above the age of 50 years with forced expiratory volume in 1 second (FEV1)/forced vital capacity (FVC) below 0.07 according to global initiative for chronic obstructive lung disease (GOLD) guideline. In an interim retrospection following the collection of data of 147 patients, we found that 14 cases (9.52%) were likely suffering from asthma and not COPD. The identification of asthma in these patients included (a) history of variability and reversibility (symptom-free periods), presence of wheeze especially during change of seasons often with symptoms of nasal allergy, and impressive response to steroid in exacerbations of symptoms along with (b) the spirometry showing a reversibility of FEV1 as 200 mL and 12% in response to four puffs of inhaled salbutamol. The screening for the diagnosis of PH included a clinical, radiological (X-ray and high-resolution computed tomography (HRCT) of the chest), and echocardiographic exercise. Hence, any coexistent respiratory problem was practically excluded. The history and the clinical profile of the selected patients did not suggest the diagnosis of secondary PH; based on significant etiologies (for instance, collagen vascular disease, obstructive sleep apnea, chronic liver disease, chronic thromboembolism) or any other plausible factors. The Doppler echocardiography ruled out a possible Class II PH in them. The peculiarities of the patients are listed in [Table 1]. Table 1 Displaying the historical, general physical, lung function and health status (COPD assessment score) of the patients. These patients could find space to be included in our COPD-PH list because the job of defining asthma has been made difficult with the omission of the reversibility criteria that brought all the obstructive airway diseases under one umbrella as “COPD” been marked by FEV1/FVC below 0.7., On review, they were asthmatics for all practical purposes as most of them had a suggestive history and clinical features and all of them had a bronchodilator reversibility [see [Table 1]. 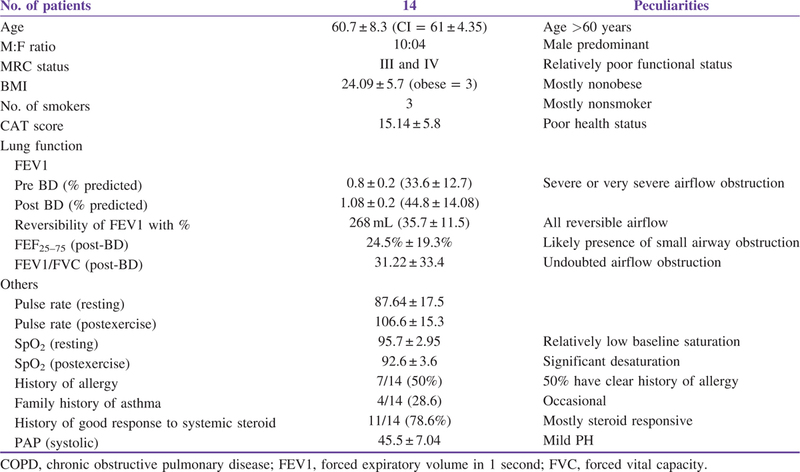 This bronchodilator reversibility, despite having long-term symptoms, reduced postbronchodilator FEV1 (44.8% ± 14.08% of predicted), and the reduced FEV1/FVC (31.22 ± 33.4) appears significant. If the FEV1/FVC is considered a surrogate marker of remodeling, then our patients had presence of significant airway remodeling to result in a reduction of loss of reversibility. The detection of the presence of PH in these patients was incidental but appears certain despite lack of direct hemodynamic measurements. We subjected them to a fixed exercise protocol (named as two-chair test) practiced at our institute, and postexercise (within 2 min) desaturation of ≥3% has been regarded significant by us mandating evaluation with HRCT and echocardiography to look for PH. We sought for the HRCT signs of PH,, and the Doppler echocardiographic examinations were accomplished by a single expert using a common machine. PH in asthma is not described or accepted in guidelines, although people have tried to draw a common mechanistic pathway to explain the bronchial muscle hypertrophy and the medial hypertrophy of the arteriole in PH. One may disagree to our observation of asthma-associated PH looming as a reality because confirmatory establishment of PH by right heart catheterization and exercise for the etiological diagnosis is absent. However, the diagnosis of PH is certain (as the HRCT signs are highly specific,,), although we cannot ascertain the exact pulmonary pressure from echocardiography. We feel that the exclusion of other causes of PH through clinical screening cannot be totally discarded. Therefore, mere disagreement cannot offer a better and alternative etiological explanation for the presence of PH in these patients. To us, there could be a PH phenotype of asthma which needs to be looked for and elaborated, or some other local and as yet not identified cause for PH may persist in association with asthma in our small cohort of patients. Incidentally, we have noticed possible PH in patients with chronic arsenicosis, which is present in endemic proportion in certain areas of Gangetic Bengal. We felt it prudent to report the observation for the sake of inducing awareness among the fraternity to look for and validate the association between asthma and PH and also to indulge in further research. Rodriguez-Roisin R, Rabe KF, Vestbo J, Vogelmeier C, Agusti A. Global initiative for chronic obstructive lung disease (GOLD) 20th anniversary: A brief history of time. Eur Respir J 2017;50:1700671. National AE, Prevention P. Expert panel report 3 (EPR-3): Guidelines for the diagnosis and management of asthma-summary report2007. J Allergy Clin Immunol 2007;120(5 Suppl):S94. Fabbri LM, Hurd SS; GOLD Scientific Committee. Global strategy for the diagnosis, management and prevention of COPD: 2003 update. Eur Respir J 2003;22:1-2. Bhattacharyya P, Paul R, Bhattacharjee P, Ghosh A, Dey R, Ghosh M, Sharma M. Long-term use of doxycycline can improve chronic asthma and possibly remodeling: The result of a pilot observation. J Asthma Allergy 2012;5:33. Bhattacharyya P, Bhattacherjee PD, Saha D, Das SK, Paul M, Samanta S. The change in pulse rate and saturation pattern in normal, COPD and DPLD patients. PulmoFace 2015;15:9-13. Bhattacharyya P, Sengupta S, Bhattacharjee PD, Ganguly D, Dutta D, Mondal S et al. Post exercise desaturation can help identifying treatment responders of COPD pulmonary hypertension in real world: An appraisal. J Pulm Respir Med 2018;8:469. Bush A, Gray H, Denison DM. Diagnosis of pulmonary hypertension from radiographic estimates of pulmonary arterial size. Thorax 1988 ;43:127­31. Tan RT, Kuzo R, Goodman LR, Siegel R, Hassler GB, Presberg KW. Utility of CT scan evaluation for predicting pulmonary hypertension in patients with parenchymal lung disease. Medical College of Wisconsin Lung Transplant Group. Chest 1998;113:1250-6. Tajsic T, Morrell NW. Smooth muscle cell hypertrophy, proliferation, migration and apoptosis in pulmonary hypertension. Compr Physiol 2011;1:295-317. Grosse C, Grosse A. CT findings in diseases associated with pulmonary hypertension: A current review. Radiographics 2010;30:1753-77. Arcasoy SM, Christie JD, Ferrari VA, Sutton MS, Zisman DA, Blumenthal NP et al. Echocardiographic assessment of pulmonary hypertension in patients with advanced lung disease. Am J Respir Crit Care Med 2003;167:735-40. Bhattacharyya PS, Sen P, Ghosh A, Saha C, Bhattacharyya PP, Das A et al. Chronic lung disease and detection of pulmonary artery dilation in high resolution computerized tomography of chest in chronic arsenic exposure. J Environ Sci Health A Tox Hazard Subst Environ Eng 2014;49:1453-61.